Yup. Hardly a week goes by without a delivery at the Hanlon household. Not all of it is gear but sometimes I'm lucky. This time it was gear but not the usual flavour. 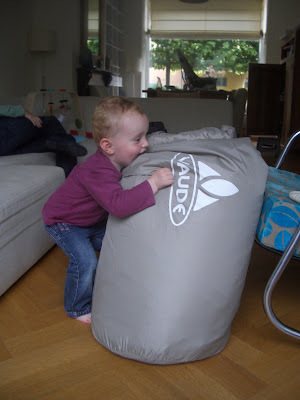 We took delivery of a Vaude Badawi II which at just the near side of 18kg (manufacturers weight: I didn't bother putting this one on the kitchen scales) isn't exactly lightweight but it does sleep six, and you can stand up in it. It also has enough room inside the vestibule to entertain two or more kids in wet weather. Although I can see the point in it, it's not entirely my doing. Jane insisted that we get a big family tent with the emphasis on BIG. I was thinking something along the lines of a Bergans Wiglo but for Jane the idea of a single shared sleeping space wasn't acceptable. Willem-Maarten also has to take some of the blame. Since Jane saw his Badawi set up, and worked out that there are tents big enough to stand up in and furnish with tables and chairs she's realised that there's a whole other type of camping going on out there. Jane doesn't do things by halves so she took Willem-Maartens example and added two more berths and a third more vestibule. Willem-Maarten predicted that we'd have a blue folding table before the month was out. Wrong. We had two, brushed aluminium folding tables within the week. The tent is great. Nice quirky design, plenty of space, well made. It's not the easiest of tents to set up and the instructions leave a lot to the imagination but I'm getting a system worked out. There's a downside though and a serious one at that. It needed a modification straight out of the box. The funny Chinese hat thing on the top of the vent is set with a flexible, circular pole around its base and four poles that run up the roof into a collector at its apex. The circular pole, however, will not stay in its (open) sleeve without the aid of some strategically placed extra elastic. With the pole out of the sleeve the risk of rain ingress through the top vent is, I think, rather large and you wouldn't want rain on your chairs and tables would you? 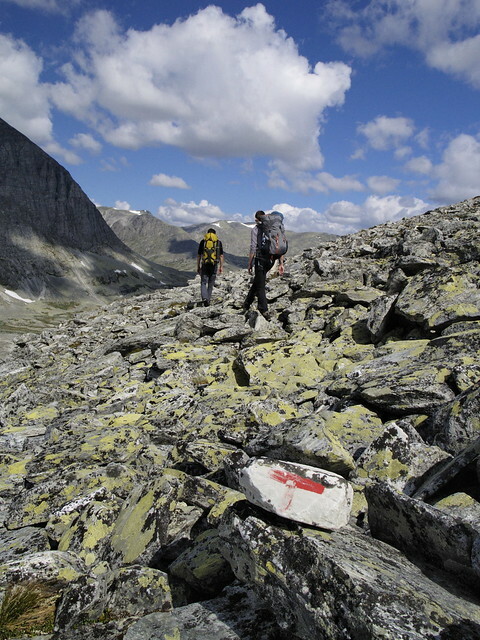 To be honest I'd expected more from Vaude. It's an expensive tent to require a mod before use. Still Emily seems to like it and I'll get over the trauma given time. Truth be told I've kept this delivery a secret for a couple of weeks. 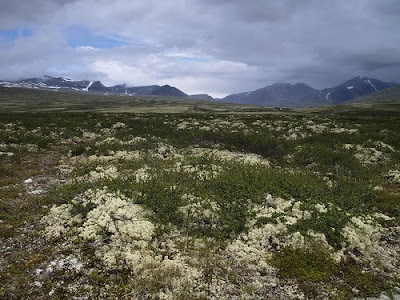 I didn't want to interrupt the flow of Rondane posts so you're only getting to know about it now. In fact we've had it long enough to have had a practice camp. We've got a Rondane reunion in September with the lads and familys in North Holland and we wanted to try and get the kids used to the idea before taking the road show away from home.There's a camp site just ten minutes down the road which meant we could set up in the morning, come home for the afternoon sleep and then go back to run barefoot in the grass, eat tea and sleep over. Great plan. We got as far as the eat tea bit but sleep was a lot harder to come by than we'd hoped. A lot harder to come by that the neighbours had hoped too. I'd forgotten what it was like to camp on camp sites with other people within earshot. There was quite some whispering along the lines of "families who can't keep their kids quite shouldn't come camping". Why is it that all the noise emerging from kids and youths having late night fun isn't a problem but a crying baby gets so under peoples skin? I guess it's the nature of the thing. Babies are tuned to make adults feel uncomfortable otherwise we wouldn't run around like idiots trying to find the cause. The problems came from an unexpected quarter. It wasn't Benjamin with his night waking and milk addiction that kept us awake but Emily. It turns out she's got a thing about zips. It also turns out that she likes to play musical beds. Good job we've got a month to bury the memories before North Holland.